Heading to the classic European track, Circuit de Nevers in Magny-Cours, the teams are looking at a technical track that needs medium-high downforce and rewards efficient aerodynamics, overall balance and smooth traction out of corners. It has a mix of high, medium and low speed corners, a fast chicane with vicious kerbs, a long straight and heavy braking. Historically, the surface is smoother than most, though that is becoming less obvious as time passes, so low ride heights are the norm, despite the aggressive kerbs on the chicane that must be ridden well. The high speed corners and significant traction areas ensures that tyre wear rates are high. 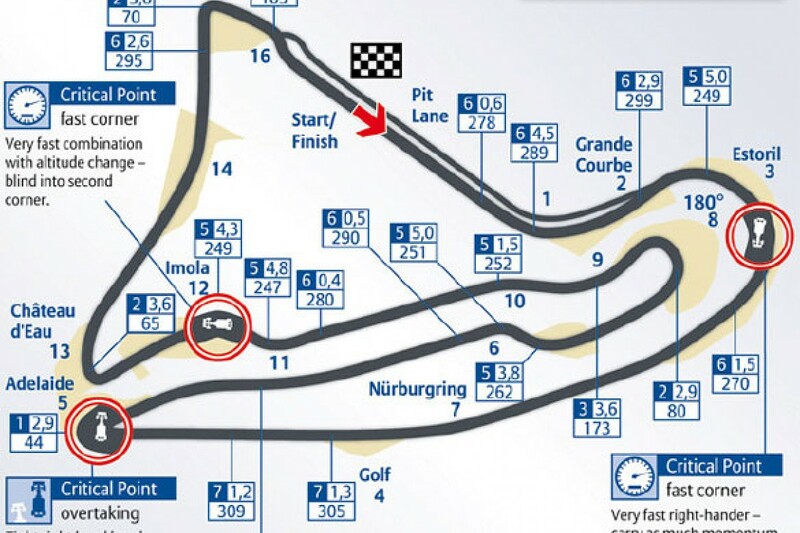 The circuit has a very definite racing line, and drafting is difficult, so even with the hairpin, overtaking is tough, placing the emphasis on qualifying well and delivering on a strong race strategy. The relatively short pit-lane offers more opportunities than usual for strategic innovation - four stops races are not impossible, though we are unlikely to see anyone execute that strategy this weekend. In 2007, qualifying went awry for McLaren, as Alonso suffered a gearbox failure on his out lap for Q3, placing him tenth - with a light fuel load. Hamilton was similarly fuelled, but an error on his final lap gave Massa the chance to pip him for pole. Raikkonen was close in third, comfortably leading Kubica's BMW-Sauber on the second row. Renault showed great qualifying form at their home event to take the third row. On race day, a poor start from Hamilton had Raikkonen slipping past to take second place behind Massa. Much of the field held their places, though Alonso made a bold move to edge past Rosberg and Trulli - who was heading back to the pits after damaging his suspension on Kovalainen's Renault. The Renault suffered a puncture, and a ruined race. Rosberg took Alonso back during the mayhem, whilst Liuzzi and Davidson tangled, ending both races. Meanwhile, at the front, Massa worked up a lead over his team-mate, who was followed by Hamilton, and the three pulled clear of Kubica. Alonso passed Rosberg again, then diced with Heidfeld, before settling in to a watching brief. Both McLarens stopped early, on lap 16, looking to pursue a three stop strategy. Massa stopped on lap 19, with his lead being eroded to 2 seconds by the time his team-mate stopped on lap 22. Both McLaren's struggled with traffic, compromising their strategy. 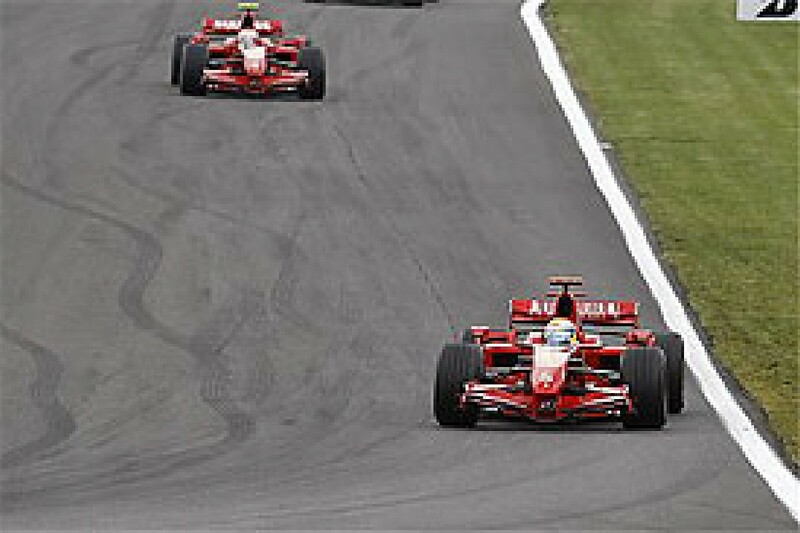 At the front, Massa failed to pull away from Raikkonen and conceded the lead during their final stop: Ferrari toured home to a comfortable 1-2 win. 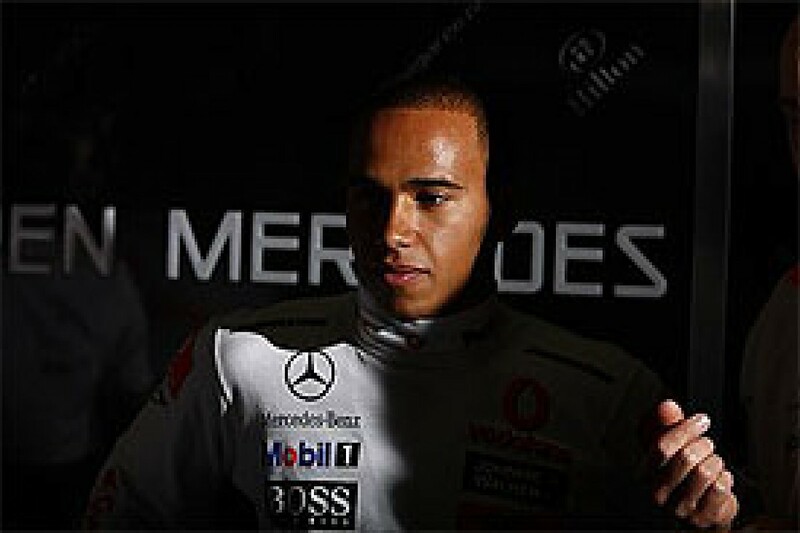 Hamilton finished third after a close battle with Kubica, whilst the Sauber duo finished with their usual strong showing. Whilst there is always the chance of thunderstorms in France, the odds are against it this weekend, so a dry race is anticipated. Air temperatures are expected to hit the low eighties on Sunday, which could lead to over 110 degrees from the track surface. The wind is expected to be light, but if it proves to be gusty things could be interesting. The mix of two and three stops last year was interesting: for the most part, three stops failed to pay off as those trying them were impacted by traffic that proved impassable... the two stoppers won out. However, it is the faster strategy if the drivers implementing it can make the moves on race day - and can take full advantage of the lighter fuel load in qualifying. After their dominant performance last year and a strong start to the year, Ferrari will arrive at France as the favourites for a win; although McLaren ought to be about as strong, they are handicapped by the 10 place qualifying penalty Hamilton faces. The win for Sauber in Canada does little to change their prospects, though they are very likely to get at least one of their drivers back on the podium this weekend. Behind the usual suspects at the front, expect a tough challenge from Renault (or at least Alonso) at their home event, as they attempt to eat in to the points lead of Toyota, Williams and Red Bull. Regular points scorers here, who can be expected to have outstanding performances, include Button and Trulli - each is capable of repeating the feat this weekend. "What I like about Magny Cours is the fact that there is a bit more time at the end of each day. No-one rushes off anywhere because there's nowhere to go, so people have more time to sit and talk. "The circuit is quite nice because of the fast chicanes, but it's always difficult to get the set-up right because a very small change in track temperature can affect lap times by as much as two seconds per lap. It can get very slippery. "From a driving point of view, the circuit has a nice rhythm and throws up different challenges. The double left-hander after the start-finish straight is taken flat-out, before the long right-hander called Estoril. It's tricky because you get a lot of rear end instability on entry, understeer mid-corner and oversteer on the exit. You also have to floor the throttle without being able to see the exit. "A long straight follows and the wind direction can affect your braking point into the Adelaide Hairpin. It's a bit slippery through here, but it's still the only realistic overtaking point on the lap. "You're in first gear, so it's important to make sure you get good traction at the exit because you're then flat-out until the first high speed chicane. You arrive in sixth gear and have just a little lift and tap of the brakes to stabilise the car. "Next, you're into a long left-hander that tightens up on you. There are several different lines through here and you have to let the car do what it wants to a degree. It's easy to lock the inside front under braking and you'll always get understeer or oversteer; I've never had a perfect balance through this corner. "Another quick chicane follows. It's slightly slower than the first one, but you have to position your car carefully because a small crest makes the apex momentarily blind. If you position the car well, you clip the kerb on the right; if you miss that kerb by a few inches you have to get off the throttle and you can easily lose 0.3 seconds. "Then you come to a first gear right-hander, which is a bit slippery on entry and exit. Then comes another right-hander, which is second gear, before you find yourself into the final chicane. The kerbs are very high, so you have to be very rough with the car through here. Then you cross the start-finish line to start another lap." France 2007: a near perfect weekend for Ferrari saw Massa on pole, and Raikkonen leading home a one-two finish, as the Italian outfit illustrated excellent form. Canada 2008: both drivers struggled with the state of the track in qualifying; on race day, Raikkonen was taken out by Hamilton as he waited to rejoin the track at a red light whilst Massa had fuel rig problems that put him to the back of the pack... he made a strong charge to finish fifth. The Montreal weekend was disappointing for Ferrari; though they were expecting to be weaker than usual, it seemed that they had the pace to put at least one car on the podium before poor fortune and equipment issues put them out of contention. By contrast, not only is the team is usually quick in France, but both drivers deliver here. 1. Kimi Raikkonen: historically, when he has finished in France, it has been in the points - bringing home two podiums besides a win last year. Although likely to be slower than Massa on a single lap, Raikkonen is arguably the favourite to win this weekend. 2. Felipe Massa: despite losing to his team-mate last year, Massa is showing improved form in 2008 and can probably be expected to retain his lead if race takes a similar turn this year; bringing home a win would go a long way to establishing his credibility as a World Championship contender, too. 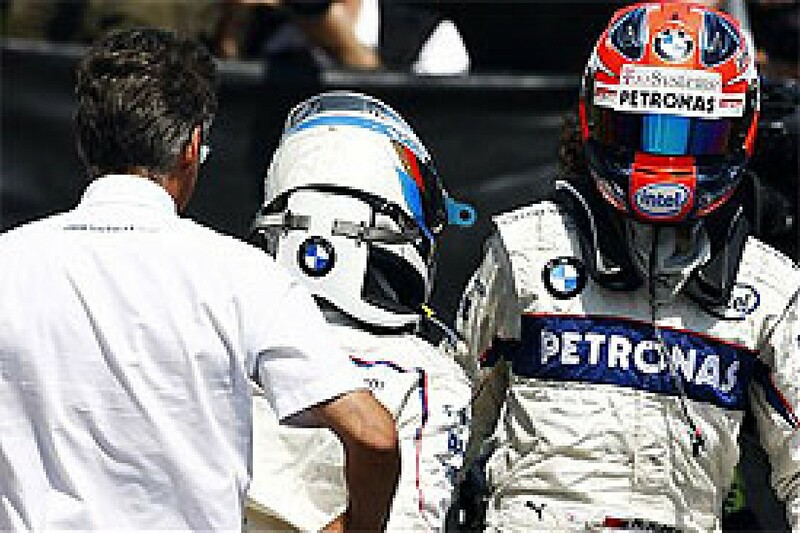 France 2007: Kubica returned from being rested after his big Canada crash, and promptly qualified then finished fourth. Heidfeld suffered recurring back problems, but managed to recover from a seventh place qualifying position to finish fifth behind his team-mate. Canada 2008: a phenomenal weekend for Sauber saw them capitalise on the mistakes of others and chaos from the safety car to bring home their first win in grand style, taking both steps on top of the podium. There is no doubt that the team earned their result in Canada, but bringing home a repeat from the weekend ahead is going to be more difficult - running at a standard European style circuit should see Ferrari and McLaren returning to their strengths. Accordingly, Sauber will still be penalising any driver who is off their game, but they will need both teams to drop the ball again if they are to win the race. 3. Nick Heidfeld: now firmly on the back foot at Sauber, Heidfeld is in need of a great weekend if he is to get back on top of his young team-mate... a tall order in France - historically, this has not been his best circuit. Objectives: At least one car on the podium. France 2007: having struggled with performance all season, Renault put together a decent qualifying performance, filling the second row on the grid. Trulli hits Kovalainen on the first lap, causing a puncture and ruining his race, whilst Fisichella battles Alonso and Heidfeld, fending off the former to claim sixth. Canada 2008: Piquet continues to struggle in Alonso's shadow, as the Spaniard qualifies fourth, but both ultimately fail to finish the race - Piquet because of brake failure, whilst Alonso came adrift as he tried to pass Heidfeld. Following up on the improved qualifying form the team has been able to show, it should not be a surprise to see at least Alonso well up the grid on Saturday for the team's home event, though this may involve a relatively light fuel load. The recent announcement that development will continue at full steam ensures that other outfits will keep an eye on them, too. 5. Fernando Alonso: always in the points when he has finished in France, and usually on the podium, Alonso represents more of a threat here, at his team's home event, than usual. The Spaniard has an affinity for the circuit, so his race day speed should be quite interesting - he might even attempt a four stop strategy in order to get out of sequence and remain light enough to pass his competitors, though this is a very aggressive strategy that will backfire completely if passing proves impossible. 6. Nelson Piquet Jr: with pressure continuing to mounts on the youngster, he is running out of time to illustrate his value to the team. A good weekend would help a lot, though there is little indication anything has changed, so it remains unlikely - perhaps racing at Renault's home venue will help, and he can finally bring home a point. Objectives: Both cars in the points. 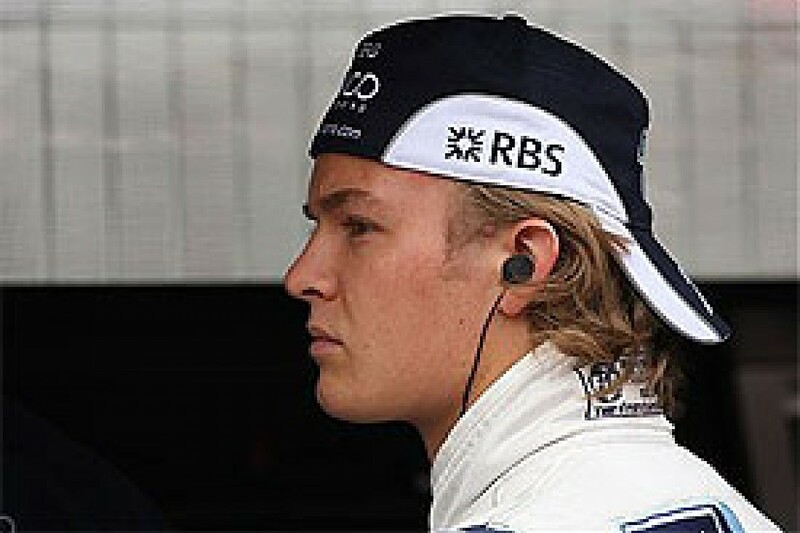 France 2007: Rosberg showed impressive form in practice, though only able to pull in ninth from qualifying, before battling Alonso, Fisichella and Heidfeld in the race - but ultimately faded, finishing outside the points. Wurz never made an impression. Canada 2008: it was a disappointing race for Williams, who saw Nakajima working up the order on race day before taking off his front wing against Button and retiring; Rosberg showed well in qualifying but he ran in to Hamilton during the pit exit fracas and later suffered a puncture, taking him out of the points. Having shown good pace in Monaco and Canada, the team are arriving in France with high expectations and have to be disappointed if they cannot come away with a couple of points. They are expected to show several developments to the aerodynamics and suspension following a good test at Barcelona. 7. Nico Rosberg: with a ten grid spot penalty to serve for his incident with Hamilton in Canada, Rosberg will be starting on the back foot. Whilst he professes to like the circuit, his results in France have not been stellar so far, so it would be asking a lot from him this weekend if he is to even finish in the points. 8. Kazuki Nakajima: although it seems that he is being overshadowed by his team-mate, Nakajima has brought home almost as many points and clearly justifies the belief the team has shown in him. Another strong performance would do no harm, though! France 2007: reliability issues continued to dog the Red Bull team, first with transmission issues interfering with Webber's practice whilst oil pressure problems left Coulthard sixteenth on the grid. On race day they were uninspiring, unable to pass in the queue that formed behind Barrichello. Canada 2008: the team struggled with the deteriorating track in qualifying, leading Webber to fight against traffic with a two stop strategy on race day, whilst Coulthard brought all his experience to bear in a fine drive to the podium, earning his first points of the season. With the podium finish in Canada to bolster their Championship position, Red Bull are now four points clear of Toyota in fourth place and keen to defend that position: another strong result this weekend would help no end as any of Renault, Williams or Toyota could overhaul them with a couple of solid race weekends. 9. David Coulthard: the last three years have not been kind to Coulthard in France, but he has been on the podium three times, even winning in 2000. He can be very quick and has illustrated an ability to overtake here that could lead to an aggressive strategy. Following up the podium from Canada with more points would make a significant difference to the way he is being perceived this year. 10. Mark Webber: despite impressing in 2002 when he drove a Minardi in to the points, Webber has really not delivered in France. The Australian has usually been able to qualify somewhere near the top ten but not convert it to points on race day. Whilst a change would be welcome, this is a circuit where he is likely to finish behind his team-mate, no matter how well he qualifies! France 2007: a hugely disappointing weekend for the team, as they left with no points; Trulli qualified eighth but collected Kovalainen on the first lap and broke suspension, whilst Schumacher had another anonymous weekend. 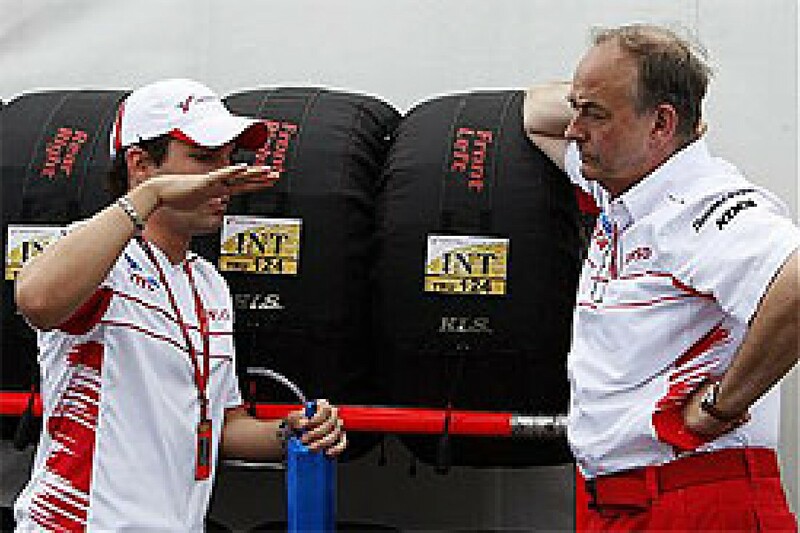 Canada 2008: Glock brushes the wall in practice, but gets his act together and finally out-qualifies Trulli. Both cars run full tanks, each leads the race as it unfolds and others peel off for fuel, and it all pays off when both cars finish in the points. 11. Jarno Trulli: as a qualifying specialist who raced for Prost, Trulli has a history of outperforming in qualifying and it would be no surprise to see him in the second or third row this weekend either. Holding on to that position is tricky but if he finishes, he will be expected to bring the car home in the points, as he has the last five times he completed the distance there. 12. Timo Glock: with a points finish in Canada, Glock is finally on the scoreboard, which will help his confidence in France - something he is going to need. The weekend ahead promises to be tough for the youngster, as this track rewards experience and his team-mate has considerably more: he will do well to be near him this time around. France 2007: the drivers ran low fuel in practice, so it was little surprise when their Saturday performance yielded the more usual low order qualifying spots. Davidson took out Liuzzi on the first corner, but Speed showed promising race pace until a late gearbox failure ended his day, and left the team with nothing to write home about. Canada 2008: it was an interesting weekend for this team, as both drivers put their cars in to the wall on Saturday morning - Vettel had to sit out qualifying, but had a strong race (admittedly with a perfectly timed single stop) to finish eighth, whilst Bourdais needed a new gearbox, then struggled with the deteriorating track on race day, having what he described as his worst weekend. With another point scored in Canada, the team is illustrating they can keep their act together when others are falling apart, which is their best route to points at this time - however, they really did not shine in the recent Barcelona test, so barring a wet weekend, or a series of mishaps for the front runners, scoring points would be a tall order this time around. 14. 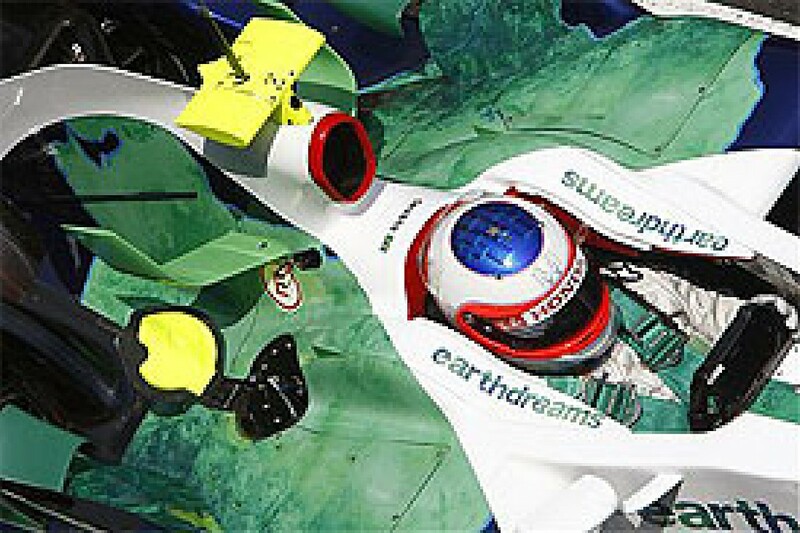 Sebastian Bourdais: after a tough weekend in Canada, the Frenchman is heading to his home Grand Prix in some disarray. If the home crowd lifts him then it will be interesting to see how he progresses on race day, as he is a capable battler - though the tough nature of passing on this track will not help. 15. Sebastian Vettel: with regular demonstrations of speed, Vettel is being looked upon as a future star and generating interest up and down the pitlane. Another strong performance this weekend will provide further fuel for the silly season rumours about his future - and provide more reason to at least talk up his salary for next year! Objectives: compete in the midfield. France 2007: anticipating a significant step forward in their terrible season, Honda showed little improvement in practice or qualifying, but their race pace was better - enough for Button to fight up to eighth and a point. Barrichello, on the other hand, continued to struggle for pace. Canada 2008: it was a mixed story for Honda, with Barrichello making the most of the car to make Q3 then run a tough single stop race for seventh place overall. Button struggles with the car all weekend, has a gearbox failure in qualifying that puts him to the back of the grid, then makes no progress in the race. Since returning from Montreal, the team has tested Davidson, besides working on bringing more elements through from development, though they are not due to be used until Silverstone. The circuit this weekend has as strong focus on aerodynamics that should be very interesting - Honda have appeared to struggle this year, regularly sacrificing top speed for downforce, even with the newer developments that have been coming through. This change between this race and the next is likely to be a strong indicator as to whether they will be able to make much impact on the second half of the season. 16. Jenson Button: this circuit suits Button, regularly seeing him put together strong races, sometimes despite the car is was in. When he has finished, he has scored points, so that has to be the goal this weekend, though he will need a decent qualifying session to repeat that trick this time around. 17. Rubens Barrichello: from fifteen races in France, Barrichello has managed four third place finishes, though his team-mate for many of those (Michael Schumacher) dominated with eight wins in the same period! This is not his strongest circuit, and a long weekend could be in store. Objectives: Fight in the midfield. France 2007: in the guise as Spyker, the team made little impression in qualifying or the race. Sutil started from the pitlane, but confuses the pit crew at the stops by arriving when Albers is due; his team-mate duly stopped then left with the fuel line still attached. Canada 2008: it was business as usual for Force India in Canada; Sutil showed the pace to make Toyota uncomfortable, but retired with a gearbox failure, whilst Fisichella span out from fourteenth. 20. Adrian Sutil: the youngster has not shown quite the electrifying form expected of him so far this year, but the Circuit de Nevers presents an opportunity to out-perform his team-mate, who is not a fan of the place. A strong performance might not offer any chance of points, but it would help team morale. 21. Giancarlo Fisichella: really not a fan of Magny Cours, Fisichella's results reflect his comfort level, as he has only scored nine points from his twelve visits - driving for Force India this year, there is little chance of that record changing. Objectives: Get the cars to the finish. France 2007: a frustrating weekend for McLaren, with mechanical glitches interfering with play - Hamilton's engine shut down on Friday, Alonso missed third practice with break sensor issues, then missed Q3 when the gearbox failed. On race day, both drivers struggled to implement their three stop strategy (Alonso switched to two), though they finished in the points. Canada 2008: it was a pointless and off weekend for McLaren in Canada, as Kovalainen struggled all weekend, qualifying poorly and managing his tyres poorly on race day, though tough timing for a stop under yellow didn't help. Hamilton failed to see a red light when exiting the pits under the safety car period, and ran in to the stationary Raikkonen, ending both their races. The team is heading to a circuit that clearly favoured Ferrari last year, and seems likely to do so again this time around, though the gap should be closer. The team has considerably improved the car since the start of the season, and whilst some of the benefits were felt at Monaco and in Canada, this is the first circuit that should really offer the full scope of those improvements: it may even level the playing field. 22. Lewis Hamilton: with a ten place grid penalty for his Canada contretemps, this will be a tough weekend for Hamilton, who will have his work cut out just to score decent points - finishing on the podium would be the result of a phenomenal drive. 23. Heikki Kovalainen: France proved to be a tough weekend for Kovalainen last year, so he will be looking for redress this time out; having struggled to make the most from the package in Canada, he should be doubly keen to put on a good show. With Hamilton starting ten places back, the onus falls on Kovalainen to take the fight to Ferrari - and offers his best chance to win a race so far this year.